Josephite Sister Maria Casey RSJ (left) with Fr Nicola Mapelli and Katherine Aigner. Picture: Supplied. The new Catholic Voice website came into existence in July 2018. Many of the great stories of last year have never appeared on the website, so as we look back on 2018, we wanted to share some of those stories with our online readers, including this great story by JOHN MCLAURIN. First published: Catholic Voice, February 2018. WHEN people think of the Vatican Museums, their minds turn to Michelangelo and Raphael. But a new book celebrates the prominent place of Indigenous Australian art and culture on display at the much-visited attraction. Australia – The Vatican Museums Indigenous Collection, which features some of the earliest known documentations of Australian Indigenous cultures, was officially launched in Canberra recently. The publication was a joint project of Aboriginal Studies Press and the Vatican Museums. Fr Nicola Mapelli, curator of the Ethnological Collections at the Vatican Museums, was in Australia for the launch. He had visited the Kimberley and the Tiwi Islands, among other Indigenous communities, in preparing for the publication of the book. Fr Mapelli said the Australian exhibit at the Vatican Museums is the first one visitors come across after leaving the Sistine Chapel – a nod to the place of Indigenous Australians as the oldest continuous culture in the world. “For the Vatican and the Vatican Museums it has been very important to enhance the Australian collection and to present it in a beautiful way,” he said. Many of the pieces in the catalogue were gifted to Pope Pius XI for an international exhibition in the 1920s that was held to expand European consciousness of other cultures. Other items came from the fledgling communities around New Norcia in Western Australia in the mid-1800s. Bishop Christopher Saunders of Broome, where many of the pieces in the Vatican Museums and many of the items featured in the catalogue originate from, said Indigenous communities will treasure the publication. “What a wonderful gift it is to the world and great recognition of Aboriginal people and their culture,” Bishop Saunders said at a special event in Sydney ahead of the launch. In addition to showcasing Indigenous art and culture, the book also contains 18 essays from Indigenous and non-Indigenous authors. The book’s editor, Australian National University historian and ethnologist Katherine Aigner, said the development of the publication brought many Indigenous communities together, sparking conversations between young and old about the history of various objects, their stories and their significance. The Australian Catholic Bishops Conference, as well as local dioceses and religious orders, provided financial and other assistance to support the project. ACBC president Archbishop Denis Hart said the publication “tells a remarkable story, offering amazing insights into our Australian history and into the wider world of which our country and our Indigenous brothers and sisters are an important part”. As well as items dating back 150 years or more, the book also features on its back cover the artwork “Pilgrimage”, which was given to Pope Benedict XVI in 2010 to mark the canonisation of St Mary of the Cross MacKillop. 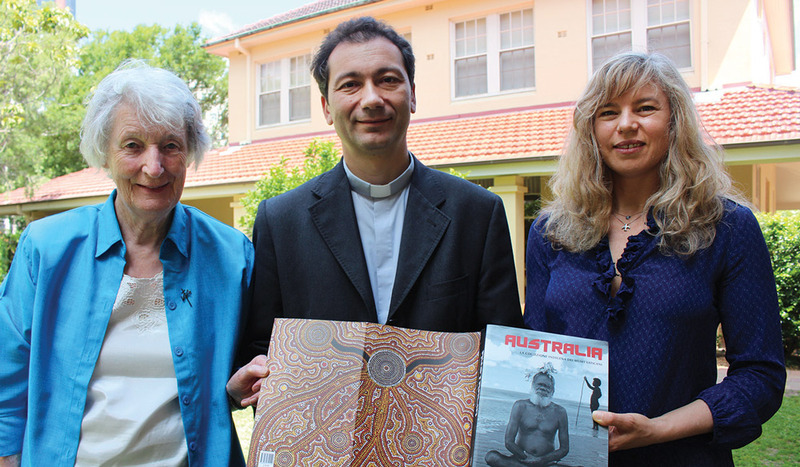 Fr Mapelli said the image, which depicts the convergence of Indigenous Australia and the Roman Catholic Church, is a fitting metaphor for the publication’s ability to bring together and celebrate those two distinct heritages.